Kalakkad Mundanthurai Tiger Reserve is an important biodiversity hot spot in Western Ghats. It is famous for the abundance of major macro fauna in Peninsular India with Tiger on the top. Apart from being the proud habitat of the biggest tiger in the state, the reserve also touts to be the only one in India to house all the five Indian monkey species. In fact, KMTR forests have shown degradation over years. Satellite imagery has shown a change in the nature of forest in the area during 1973 to 2004 with evergreen forests getting reduced. Presently, it has evergreen, semi-evergreen, moist, and dry deciduous forests, grasslands. Slopes filled with reeds especially in Oothu, Kakachi and Sengaltheri and increasing grasslands are an after-effect of recurring wild fires, which again causes degradation of the forest. Known as 'Thevangu' in native Tamil and Malayalam, this 26 cm long monkey is the smallest of the tribe in KMTR. Among the Slender Lorises which are found only in South India and Sri Lankan forests, Mysore slender Loris and Malabar slender Lorises are endemic to South India. This small monkey which weighs a maximum of 285 gm prefers shrub rich deciduous forests with thick undergrowth. Being nocturnal, its big eyes are the most notable feature. They catch insects and make up an occasional fruity dish. This no-tail monkey is famous for its slow movement which helps it evade predator's eyes. They curve as a ball to sleep and usually sleep in groups. Male Lorises mark large territories with urine which often intersects with smaller territories of one or more female Lorises. Points on the field trip: Despite being smaller and slower, Loris growls and bites fiercely when threatened and moves faster to get away, though they never leap. They can be heard making whistles in the night to contact others and to keep the territory. Remember: One can spot them in night with the torch lights since the big eyes shine well, but remember, you are hurting them with a strong light beam. Though once considered as a single species, Common Langurs have a lot of sub species among them. The common Langurs found in KMTR are endemic to South Western India and Sri Lanka. They are bigger when compared to Lorises, with an adult male weighing up to 18.3 kg and female 11.2 kg with average tail lengths between 69 cm to 101 cm. They spend more time on ground than other Langurs. Known as Vellamanthi in Tamil for their greyish white hair, they eat young leaves, unripe fruit and seeds. Common Langurs have interesting group behaviours. The groups will have a dominant male and many females. Male infants, when they become adults are forced to leave the group to join groups of similar single males. However, they often try to defeat the dominant male of a group. The male which takes over a group, kills all infants from the past leader of the group. Identification: The crest of hair, grey hands and backward looping tail are the major marks for identification. The special stomach for digesting leaves also gives them the large bellied look which helps in identification. Points on the field trip: They spent more time on ground than other Langurs. Found in wooded areas and even in towns. In KMTR they are present in Mundanthurai, Papanasam and also in Kadayam and Thirukarangudi range. Called Karumanthi in Tamil and Malayalam, these black monkeys are endemic to Western Ghats of Kerala, Tamil Nadu and Karnataka and found in elevations between 300 msl and 2000 msl. Living on a leaf diet, these monkeys weigh 11 kg to 14 kg in adulthood with an average tail length range of 68 to 97 cm. They too are found in groups of 4-24 members in tree tops spending almost half day eating leaves and seeds. Usually groups will have 8 to 9 members including an adult male. Though male groups are also found, female groups and groups with many adult males are rare. Identification : The black hair and greyish crest of hair are the major marks. However, infants till the age of 10 weeks will have reddish brown body hairs. Females have a patch of white hair on their inner thigh which helps easy identification. Points in the field: Found in moist deciduous forests, semi-evergreen forests, evergreen forests and plantations. In KMTR, they can be found at lower elevations of the Mundanthurai plateau in forests along the Servalar River and higher elevations like Sengaltheri in Kalakkad range. They feed mostly on mornings and evenings. The most prominent thing is their whooping call from the group head to make its presence known to other Langur groups. Remember : Nilgiri Langurs are rampantly hunted for the alleged medicinal capacity of its flesh. Endemic to Peninsular India, bonnet macaques are the most popular in South India, with two sub species in India. The smaller and paler one with longer hairs on its whorl is found in Kerala and Tamil Nadu including forests of KMTR. Found in all types of forests barring wet evergreen forests, due to their ability to live of different diets including fruits, seeds, plat parts, eggs of birds and insects. Called 'Vella kuranagu' (white monkey) in Tamil, they are smaller than Langurs both in weight (3.9 KG to 8.8 KG) and tail length (33 cm to 63.9 cm). Their group strength differs from 5 to 75 with many adult males staying with the group like females, and build strong relationships. Remember: Don’t try to feed them, if you don’t want to call them a menace later ! Found only in wet evergreen forests, roughly around 4000 'LTM's ( as they are fondly called by KMTR staff) remain on the earth and are distributed along Kerala, Karnataka and Tamil Nadu forests. About 202 specific food plants of LTM recorded from Kalakkad makes KMTR a major survival spot of this rare primate. Known as Singavaal kurangu in Tamil and Simhavalan Kurangu in Malayalam, ( both means monkey with a lion tail) they grow to attain 3 to 10 Kg weight. Tail length is smaller than Langurs with average length ranging from 25 to 38 cm. Living on a diet of leaves and insects, small animals like frogs, snails, lizards, baby giant squirrels, mushrooms and flowers, they start giving birth late , at 5 to 6 years of age and deliver less number of births. Time between births are longer which makes their population change slowly, making it risky for them to survive if a sudden fall happens to the population. Groups will have 7 to 40 members with a usual ratio of one adult male and 6 to 7 adult females per group. Males leave the group on reaching maturity. Identification: looks like Langurs, but have smaller tail, with the tuft of hair which makes it a lion's tail. They leap occasionally and walk through branches often. 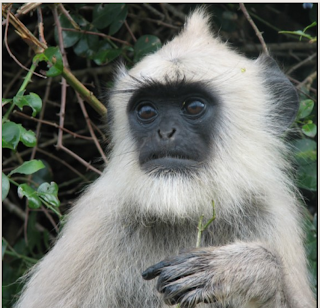 Hairs around LTM’s face are white, but on Nilgiri Langur it is light brown. Points in the field: keep ears sharp. When feeding, members of the group scatter over a large area and keep in contact through coo calls. Male's call is like a bark. Remember: They are shy and flee once they detect your presence, so keep silent on LTM watch. Got any interesting experience with monkeys in the forest? Share it in your comment. Courtesy: Monitoring primates: a guide for Kalakkad Mundanthurai Tiger Reserve by Rohini Mann, H.S. Sushma, V.K. Melkani and A. Udhayan and Forest department staff at Kalakkad forest range office.